UT System Board of Regents authorizes $70 million for construction of facilities. Sept. 6, 2018) — UTSA has received a $70 million commitment from The University of Texas System Board of Regents for construction of two new facilities at its Downtown Campus for a National Security Collaboration Center and a proposed School of Data Science. The funding, approved today by Regents and designated from the Permanent University Fund, significantly advances UTSA President Taylor Eighmy’s vision of creating new academic and research initiatives that serve as economic catalysts for San Antonio and further position the city and university as global leaders in cybersecurity, data science, artificial intelligence, and information management and technology. “The economic future and well-being of San Antonio is very much tied to big data, data sciences, information management and technology, and cybersecurity. By creating an ecosystem here that brings together the business strengths of our community and the research expertise of UTSA, we will establish San Antonio as the Silicon Valley-equivalent for data science, information management and cybersecurity,” said Eighmy. According to a study conducted by Frost & Sullivan for the Center for Cyber Safety and Education, two-thirds of global cybersecurity employers said they did not have enough employees to address current threats. By 2022, it is estimated there will be a demand for an additional 1.8 million information security and technology professionals in the United States to keep critical information and intellectual property safe. The $33 million National Security Collaboration Center will comprise 80,000 square feet of innovation space, laboratories and research facilities and will serve as a hub for government, university and industry partners in the cybersecurity field. It will focus on forensics, visualization and analytics, network security, cyber training/workforce development, big data analytics and privacy, post-quantum cryptography, cyber physical systems and embedded security, security of the cloud, attack and threat modeling and mitigation, machine learning and artificial intelligence, platform and software integrity, and hardware integrity. Several prominent businesses including Parsons, Raytheon, Booz Allen Hamilton, Noblis and Accenture have expressed their intentions to join the NSCC. UTSA has already established federal partnership agreements with the National Security Agency, U.S. Army Research Laboratory, the U.S. Secret Service, 24th Air Forces Cyber and 25th Air Force. To further strengthen the ecosystem, the U.S. Department of Energy’s Pacific Northwest National Laboratory, Idaho National Laboratory and Sandia National Laboratories have all executed partnership agreements with UTSA to work within the NSCC. “I believe the only way we can move at the speed of relevance in the 21st century is to collaborate and innovate more deeply between universities, government, and private companies in order to explore creative solutions. The model UTSA is creating will help the entire community move forward faster together to create economic opportunity and protect national security,” said Lt. Gen. Steven Kwast, Commander, Air Education and Training Command, Joint Base San Antonio-Randolph. When construction is completed, the $57 million School of Data Science building will comprise 138,000 square feet of classrooms, laboratories and research space. The initiative will place UTSA’s 70-plus faculty members in cybersecurity, cloud computing, data and analytics, and artificial intelligence under one roof in the heart of the city, providing government, industry and community partners with access to UTSA’s nationally recognized programs and talent. The proposed School of Data Science will include UTSA’s existing departments of Computer Science, Computer Engineering, Statistics & Data Sciences, Information Systems and Cyber Security, and the UTSA Open Cloud Institute. These departments will be co-located in the new facility. At that time, UTSA will seek approval from both the Board of Regents and the Texas Higher Education Coordinating Board to formally establish the school. UTSA will continue to offer bachelor’s, master’s, doctoral and certificate programs to expand the pipeline of highly trained professionals who protect government and business networks. Enrollment in these programs is expected to grow significantly after the new building is opened. 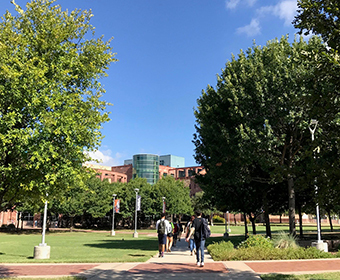 Initial cost for the two facilities is estimated to be $90 million and UTSA intends to move swiftly to identify and pursue additional funding resources for the remainder of the construction. Specific locations for the two buildings on the Downtown Campus and construction schedules are being assessed as part of a larger planning process currently underway to achieve the full potential of the university’s Main and Downtown campuses. That includes maximizing UTSA’s downtown location and resources, and collaborating university-wide with business, community and civic leaders to bring a new era of education, job training and job creation to San Antonio. The UTSA Downtown Campus is also home to the UTSA College of Architecture, Construction and Planning, the UTSA College of Public Policy, and several programs in the UTSA College of Education and Human Development.